Somewhat Boldly we welcome a new understanding. Together we have unused business growth assets; unused monetization methods; unused commitments to share and grow; unused science to innovate and save; AND unused concepts of first thing first. We also have unused "parts" in the businesses, schools, organizations, faith base, and community of effective citizens in a massively changing world of social/business communication. Discussions of this paradigm makes for possible confusion with surface understandings but includes outlets to plug in your expertise. We are about creating new money from old, new delivery from old, new persistence and guarantee, “new science” applications, and new communication to create positive expectations from constraining budgets. Importantly you can use this site to start positive expectations within 30 days saying good-by to the reliance on big government and "wall street created money" to do first things first. The science is in; The initial testing is done; Proof of the ROI is good enough; New Money can be monetized / created from old money using the bridge. The powerful policy makers must decide to pay now or later. School districts can take control of K-12 proficiency by judiciously defining first things first and aligning early education for 100% of the at risk children with their kindergarten requirements. 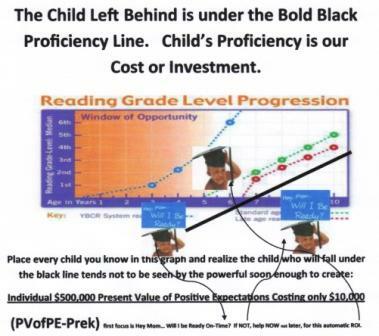 They must purchase FTFRTFT PVofPE-Prek with the New Money. How we do this is very important to ourselves and the most at risk of those at risk. Business will help with the the adapted knowledge of quality is free creating the payback and will support the urban school in it's definition and purchase of FTFRTFT PVofPE-Prek. There is no choice, Quality is to be made free and without tears. We fail to create positive expectations when we fail to show school districts the way to New Money and they end up within competitions for less and less. Everybody! 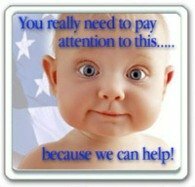 But, mom's with at risk children for sure, need to understand language development is time sensitive. Importantly, individually, intrusively, mom must deliver the skills or get help. This is just as important to expectations as seeking food, shelter, clothing and healthcare. The need for this communcation is continuous and must be attached to daily basic commercial communication via a PSM. Real growth depends on this "new" message to everyone. There is a new business in new advertising, promotion, and social communication as this disruption is locally inserted into the economy.